Brandefy would like to say a very big "THANK YOU" to those who reviewed products for us and sent in their findings and opinions. We requested followers join our review club, and boy did they deliver! We are using these reviews to let you know what you should grab in the New Year, and what to leave behind. Let's start with the best of the bunch. Our "Nice List" so to speak. Reviewers found the store brand to be the exact same, if not better. We will be updating you with our "Naughty List" following this post. To kick it off, we'll go with the most bold comparison in the bunch. We sure are glad to have this one! 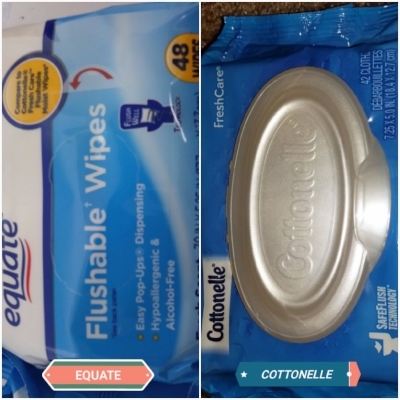 This consumer reviewed the Cottonelle Fresh Care Flushable Wipes and the Walmart version: equate Flushable Wipes. Not only did our reviewer friend find the equate version to be more thick and plush, the box came with 6 more wipes than the name brand version. This has been deemed a great place to switch! Keep your bum fresh for less with the equate wipes. Another review that came out a win for the generic was up&up Deep Moisturizing Body Wash vs. Dove Deep Moisture Body Wash. The reviewer did not notice any difference in the washes except that she preferred the smell of Target's up&up wash. We'll always take the better smelling product, personally! Reviewers preferred the smell of the store brand better! Yet another product our review club found worth switching for is the equate Oil-Free Eye Makeup Remover vs. Neutrogena Oil-Free Eye Makeup Remover. The tester here found them to be nearly identical in ingredients and effectiveness- that works for us! The final review to make our list made it because of the extra features it came with. A reviewer tested the Gillette Venus Embrace razor against the up&up Five Blade Disposable Razor. The reviewer said the only negative of the up&up version was that the packaging was difficult to get into at first. Once opened, she found the razors to be very similar. What pushed this onto the nice list for us was that the store brand had a more substantial handle and it came with a suction caddy to hold it onto the tile. We love extra swag! While there were a few more reviews that just missed this list, we tried to stick with high standards. We truly appreciate the detailed reviews, and hope these findings help many. Thank you again, Review Club!